Polish Foreign Minister Jacek Czaputowicz and Saudi's Minister of State for Foreign Affairs Adel al-Jubeir attend a joint meeting of European Union and League of Arab States foreign ministers in Brussels, Belgium, Feb. 4, 2019. "The idea was to give them red carpet treatment and start engaging with them more, see what we can do on migration," said one European diplomat. "But now we are in an unlucky spot as some of the [Arab League] national leaders are not our favorites." There were "more complications on the European side than the Arab side," Aboul Gheit said. In a friendly but public sign of disagreement, Mogherini snapped back: "I would say the contrary." The EU wants to focus at this month's summit on migration, but that is a fraught area in which EU member states disagree sharply among themselves. Hungary, led by an anti-immigration hardliner, vetoed Monday's joint declaration over the subject. "This summit has been very difficult to organize, to find a date, nobody really wants this," another EU official said of the top-level talks later this month. "For the EU it is all about migration, but there are so many other touchy subjects that people would rather not address." 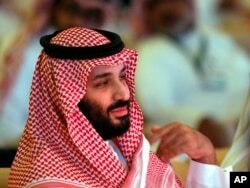 A key change in the European-Arab relationship in recent months has been the collapse in the global standing of the wealthy and influential Arab leader, Saudi Arabia's Crown Prince Mohammed bin Salman. The West's relationship with Saudi Arabia — the world's biggest exporter of oil and second biggest importer of arms — has been the bedrock of its ties to the Arab world for decades. 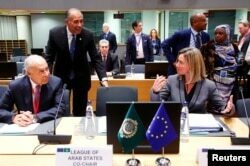 Adel al-Jubeir, Saudi Minister of State for Foreign Affairs, arrived at Monday's meeting in Brussels speaking as if little had changed: the sides faced common challenges "like countering extremism and terrorism," he said. "There are also big offers related to trade and investment." Nor is Crown Prince Mohammed the only potentially awkward guest for the EU. 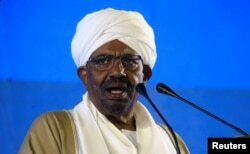 In recent weeks, Arab states have been showing solidarity with Sudan's President Omar al-Bashir, who has been facing the most sustained anti-government demonstrations at home of his 30 years in power. "We don't deal with him directly, but we deal with Sudan," an EU official said. "They could send somebody else." A guest even more unwelcome to the Europeans will not be invited to this summit, but could be at a future one soon: Syria's Bashar al-Assad. 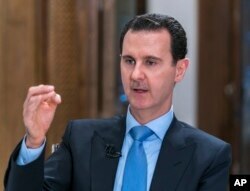 Hostility to Assad has long been an issue on which European countries agreed with the leading Arab states, which suspended Damascus from the Arab League in 2011. But with Assad's future now all but secured by Russian and Iranian forces, some Arab countries are pushing to readmit Syria. Most EU countries are not ready to rehabilitate him. "We are not in a situation today to renew a normal relationship with Syria," Belgium's Foreign Minister Didier Reynders said Monday. "Preparations for the summit are going very slowly, it's all rather uncomfortable," one EU diplomat said, but stressed there were no plans to call the whole thing off. "There are plenty of embarrassing traps to avoid, like sitting at one table with the Saudis, Sudan's Bashir, or even Assad returning."